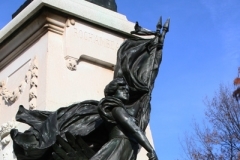 The Rochambeau statue project began around 1901 after Congress passed a bill for $7,500 for the purpose of purchasing a statue, and in 1902 Congress appropriated another $15,000 for the foundation, pedestal, transportation and other expenses for the Rochambeau statue. In all Congress passed 4 appropriations for the statue. Two totaling $22,500 for the statue and pedestal and foundation, and two more appropriations for the reception of the guests, and the entertainment of the French mission totaling $20,000. France contributed $7,500. 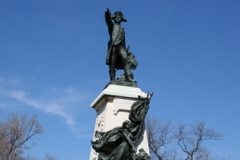 In 1900 a statue of Rochambeau was unveiled in Vendome, France, and a statue of George Washington was unveiled in Paris. 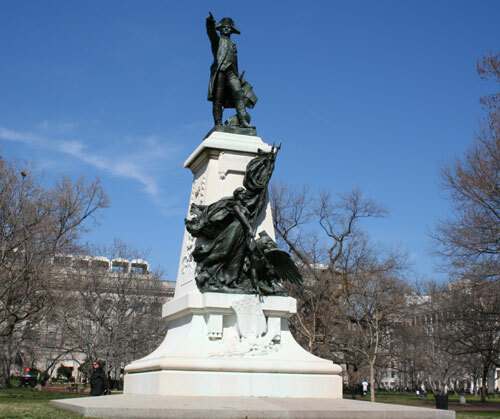 At that time is was suggested that a statue of Rochambeau should be placed in Washington, D.C., and M. Jules Boeufve, chancellor at the French Embassy, was the initiator of the idea of placing a statue of Rochambeau in the nation’s capital. It is a replica of the statue sculpted by Ferdinand Hamar which sits in Vendome, France. Rochambeau is depicted in his general’s uniform during the Battle of Yorktown. His right arm is raised and he is pointing, and in his left hand he holds a map and plan. At the front of the statue is the figure of Liberty stepping out of a boat. She is holding the entwined flags of the United States and France. 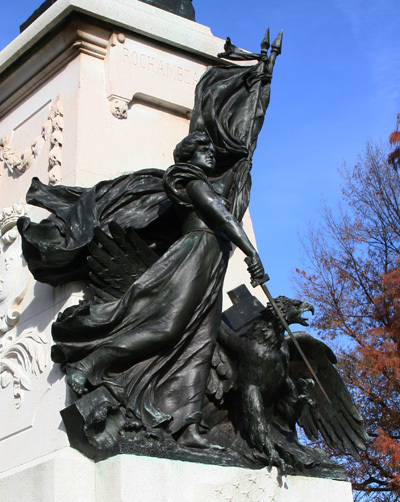 In her other hand she is holding a sword that is outstretched and protecting an eagle that represents a young and defiant America. 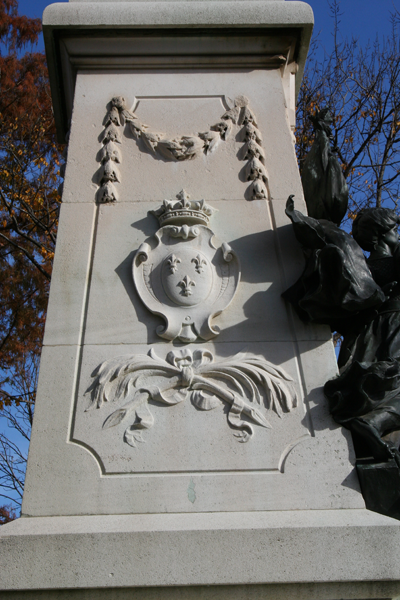 On the pedestal are thirteen stars representing the thirteen original colonies, under which is simply the name Rochambeau. 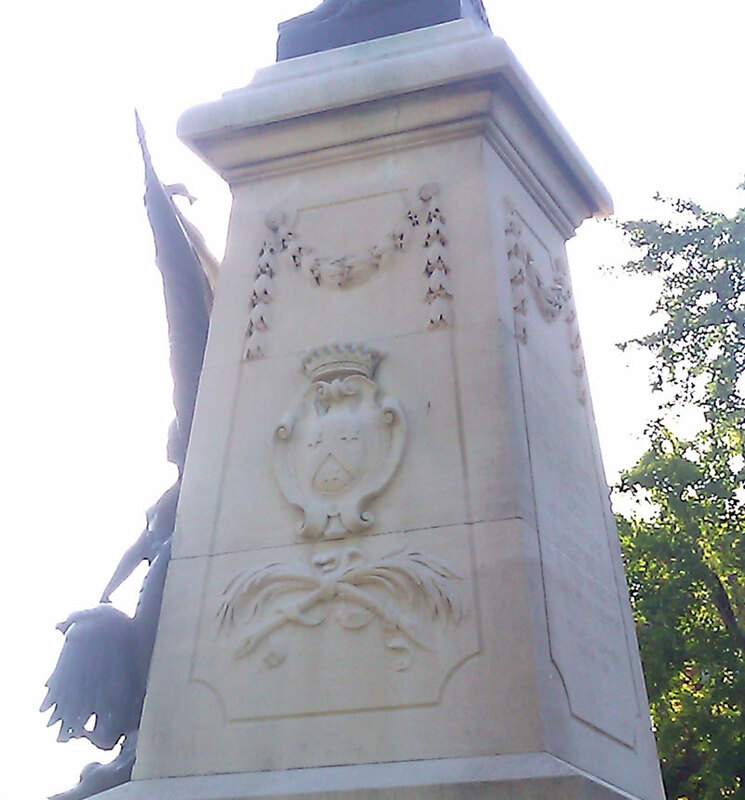 On one side is the Rochambeau family coat-of-arms – three stars, on the other side is the fleur-de-lis of the French monarchy. On the fourth side is a shield with stars of the American Union. We have been contemporaries and fellow-laborers in the cause of liberty, and we have lived together as brothers should do, in harmonious friendship. 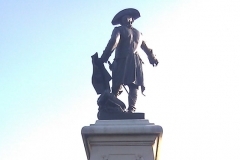 A huge contingent from France came over for the unveiling on May 24, supposedly the anniversary of Count de Rochambeau’s entrance into the French army. The large delegation included the Count Rene de Rochambeau and Count Paul de Lafayette. Also in the French delegation was Gen. Brugere, commander-in-chief of the French army, vice president of the superior council of war, and the inspector general — they sailed to America on the battleship Gaulois. 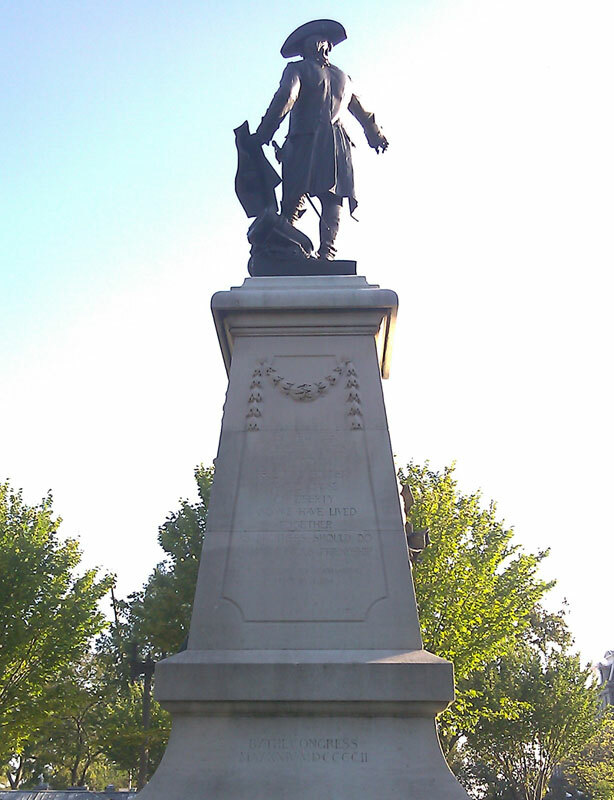 Senator Henry Cabot Lodge dedicated the statue. The dedication ceremony was attended by several thousand people who sat in stands on three sides of the statue (the south, east, and west). President Theodore Roosevelt was at the ceremony as were members of Congress, the French mission, and members of the foreign legations.